1. Bow; 2. Stem; 3. Head. 4. Topgallant forecastle; 5. Waist or amidships; 6. Gangway; 7. Quarter deck; 8. Poop; 9. Quarter; 10. Stern; 11. Taffrail; 12. Counter; 13. Wheel; 14. Rudder or helm; 15. Binnacle; 16. Cat head; 17. Anchor davit; 18. Side-light guard; 19. Boat davits; 20,21,22. Fore, main and mizen chains or channels; 23. Bowsprit; 24. Gammoning; 25. Bowsprit cap; 26. Bowsprit shrouds; 27. Bowsprit horses; 28. Dolphin striker; 29. Jib-boom; 30. Flying jib-boom; 31. Jib-boom foot ropes; 32. Bobstays; 33. Martingale; 34. Fore mast; 35. Fore rigging or shrouds; 36. Futtock shrouds; 37. Lubber’s holes; 38. Fore top; 39. Fore-mast cap; 40. Fore-top mast; 41. Doublings; 42. Fore-top mast rigging; 43. Fore-top mast crosstrees; 44. Burtons and pendants; 45. Fore-top-gallant mast; 46. 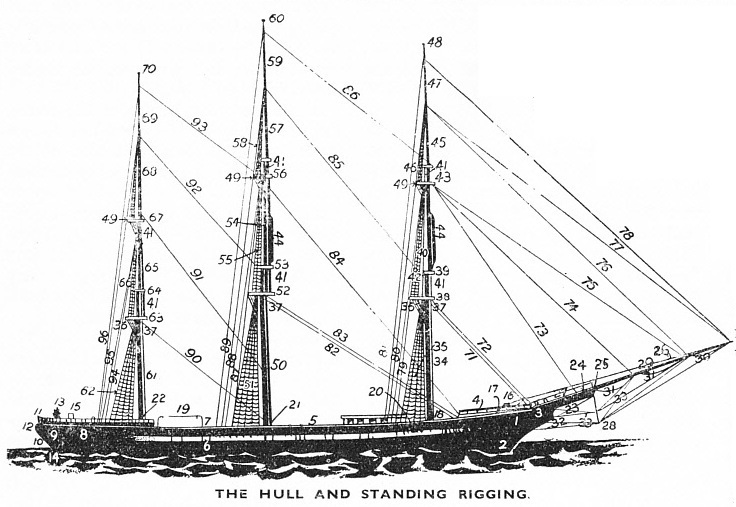 Fore-top-gallant rigging; 47. Fore royal mast; 48. Fore truck; 49. Backstay outriggers; 50. Mainmast; 51. Main rigging or shrouds; 52. Main top; 53. Main mast cap; 54. Main top mast; 55. Main topmast riggings; 56. Main topmast cross-trees; 57. Main top-gallant mast; 58. Main top-gallant rigging; 59. Main royal mast; 60. Main truck; 61. Mizen mast; 62. 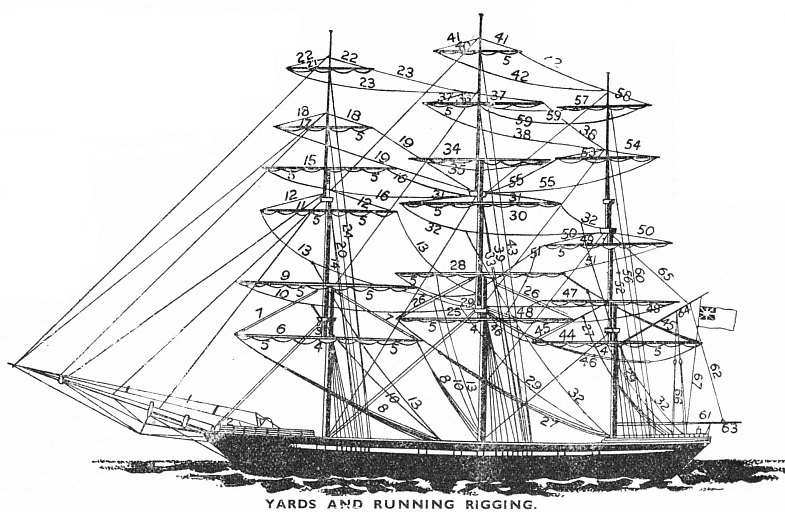 Mizen rigging or shrouds; 63. Mizen top; 64. Mizen mast cap; 65. Mizen top mast; 66. Mizen top mast rigging; 67. Mizen top mast crosstrees; 69. Mizen royal mast; 70. Mizen truck; 71. Fore preventer stay; 72. Fore stay; 73. Fore top-mast stay; 74. Innerjib stay; 75. Outer jib stay; 76. Fore-top-gallant stay; 77. Flying jib stay; 78. Fore royal stay; 79. Fore t’mast backstays; 80. Fore t’gallant b’kstays; 81. Fore royal b’kstays; 82. Main preventer stay; 83. Main stay; 84. Main top-mast stay; 85. Main t’gallant stay; 86. Main royal stay; 87. Main t’mast b’kstays; 88. Main t’gallant b’kstays; 89. Main royal backstay; 90. Mizen stay; 91. Mizen top-mast stay; 92. Mizen t’gallant stay; 93. Mizen royal stay; 94. Mizen t’mast b’kstays; 95. Mizen t’gallant b’kstays; 96. Mizen royal back stay. t’gallant halliards; 40. Main royal yards; 41. Main royal lifts; 42. Main royal braces; 43. Main royal halliards; 44. Cross-jack yard; 45. Cross-jack lifts; 46. Cross-jack braces; 47. Lower mizen top-sail yard; 48. Lower mizen top-sail braces; 49. Upper mizen top-sail yard; 50. Upper mizen top-sail lifts; 51. Upper mizen top-sail braces; 52. Upper mizen top-sail halliards; 53. Mizen t’gallant yard; 54. Mizen t’gallant lifts; 55. Mizen t’gallant braces; 56. Mizen t’gallant halliards; 57. Mizen royal yard; 58. Mizen royal lifts; 59. Mizen royal braces; 60. Mizen royal halliards; 61. Spanker boom; 62. Spanker boom topping lift; 63. Spanker sheet; 64. Spanker gaff; 65. Spanker gaff lift; 66. Spanker vangs; 67. Signal halliards. You can read more on “Rigs of Sailing Ships”, “Romance of the Racing Clippers” and “Speed Under Sail” on this website.